Nutone Cheerful Earful advertising sign circa 1955. This sign was part of an in-store display. The slogan: “A Cheerful Earful” was introduced in1955. 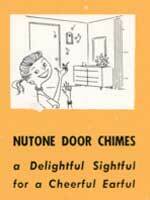 The original full slogan referred to both the look and sound of door chimes as: “A delightful Sightful for a Cheerful Earful. Clipping from 1955-1956 Nutone Dealer Advertising circular.